Need clarification on some mechanics in the Pathfinder Roleplaying Game? You’re in the right place. Take a seat with veteran game designer Skip Williams. Not sure how a spell works? Curious why that monster does what it does? Trying to get your feats to play nicely together? Skip has the answer. 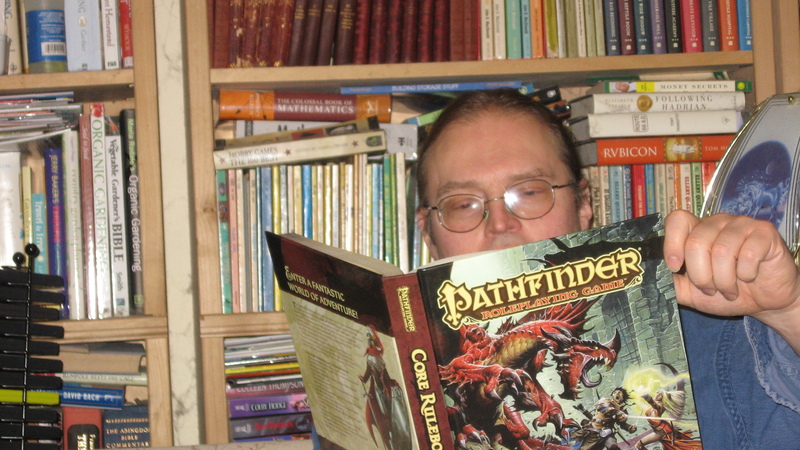 Post your new questions for Skip about the Pathfinder Roleplaying Game in the comments below. 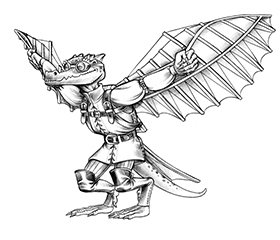 Whoever gives us the best question will win a Kobold Quarterly pdf subscription (or pdf gift subscription)! Do these adjustments stack with each other, or do they overlap? 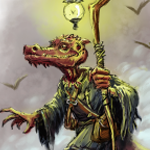 For example, if my fighter has an 8 Wisdom and then becomes a wererat, he’d have a 10 Wisdom in human form, but in hybrid/animal form, would it be 13 Wisdom (a dire rat’s Wisdom, overlapping the +2 adjustment) or a 15 Wisdom (a dire rat’s normal 13 Wisdom, +2)? Judging from the ability scores shown in the Bestiary, you should stack the adjustments. That is, when dealing with an animal or hybrid form, start with the base humanoid’s ability scores or the base animal’s ability scores—whichever is higher—and apply all the lycanthrope adjustments (+2 Wisdom, -2 Charisma, +2 Strength, +2 Constitution). The example character would have a Wisdom score of 15 when in animal or hybrid form. Q: Just when can a character afflicted by a hideous laughter spell attempt a saving throw to end the spell? What can the character do when afflicted with the spell? The spell description says “no actions.” What does that mean? Is the subject unable to use standard actions, move actions, or all actions? As worded, it could mean no yelling of messages to an ally since that’s a free action. When a hideous laughter spell strikes, the subject can attempt a Will save to negate the spell. This is not an “action” but a normal part of resolving the spell. If the save fails, the subject is afflicted with gales of laughter and falls prone. The subject isn’t helpless but can take no actions. In this case, an “action” is anything shown on Table 8-2, including non actions such as taking a 5-ft. step and any free action not specifically shown on the table (more on this in the sidebar). The subject does nothing but laugh and cannot communicate with foes or allies. You can think of the spell as forcing the subject to use a full-round action each round to laugh, but with no additional activities (such as free actions) tacked on. Once hideous laughter strikes, the subject can attempt one more saving throw to end the effect. The subject makes the save during his or her next turn after the spell strikes. While this is not an “action,” a successful saving throw in this case counts as a full-round action for the subject (think of it as the subject making a supreme act of will to stop laughing). The subject can use free actions or take a 5-ft. step after ending the spell with a successful saving throw. On the other hand, if the save fails, the subject keeps laughing and can do nothing else. In game terms, an action is any activity a creature initiates that allows it to interact with or alter the game world in any significant way. This includes anything defined in the rules as a standard, move, full-round, free, swift, or immediate action. It also includes any act of will that moves the creature from place to place. If you cannot take actions, you cannot take a 5-ft. step. Certain very important game activities are purely reactive and are not “actions.” These include making saving throws and mounting a combat maneuver defense. For example, since you’re caught unaware when a battle starts, you cannot act during the surprise round that begins the battle. You can, however, make saving throws and defend against combat maneuvers when surprised. Some conditions might preclude some defenses. For example, you probably can’t resist a grapple if you’re paralyzed. Great great stuff! Thanks a ton for tackling these Skip! This is absolutely fantastic. I am very excited to continue to get answers to the many questions which will arise from a fantastic game. With the wording changes to the Spring Attack feat it’s not clear if one can combine Spring Attack with Vital Strike. So simply put is it possible or not?